Salt Water Irrigation Yields Tasty Tomatoes Researchers report that growing cherry tomatoes in diluted seawater can make them tastier and richer in antioxidants. The findings could encourage the use of slightly brackish water in tomato agriculture, extending precious supplies of fresh water. 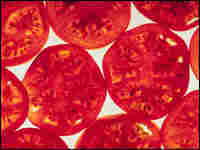 Researchers report that growing cherry tomatoes in salty water can make them tastier and richer in antioxidants. Using diluted seawater to irrigate the tomato plants puts an environmental stress on the plants that causes them to produce higher levels of certain compounds in an attempt to cope with the stressful conditions. Happily for humans, those same compounds are thought to have healthful effects when consumed, and some of them improve the flavor of the tomatoes as well. Riccardo Izzo, a professor of agriculture at the University of Pisaone in Italy, talks about the findings, which researchers hope will encourage the use of slightly brackish water in tomato agriculture, extending precious supplies of fresh water.